Milciclib (PHA-848125) is a potent, ATP-competitive CDK inhibitor for CDK2 with IC50 of 45 nM. It is >3-fold more selective for CDK2 than CDK1, 2, 4, 5, and 7. Phase 2. Cell survival curves of A549 cells treated with increasing doses of A-674563, PHA-848125, and H89 2HCl for 72 hours. Cells were incubated with cell proliferation reagent WST-1 for 2 hours and absorbance was read at 450nm. Optical density was then normalized to a 1% DMSO control. The data is presented as the percentage of cell survival relative to the DMSO control ± SEM of three independent trials. Statistical significance was determined with multiple T-tests using the Holm-Sidak method without assuming a consistent SD and is represented by *p<0.05. PLoS ONE, 2018, 13(2): e0193344. Milciclib (PHA-848125) purchased from Selleck. PHA-848125 inhibits, although with lower potency, the activities of cyclin H/CDK7, cyclin D1/CDK4, p35/CDK5, as well as cyclin E/CDK2 and cyclin B/CDK1 with IC50 values of 0.15, 0.16, 0.265, 0.363, 0.398 μM, respectively. Thropomyosin receptor kinase A is also inhibited by PHA-848125 in the same nanomolar range as CDKs. In the most PHA-848125-sensitive cell line, PHA-848125 induces a concentration-dependent G(1) arrest. PHA-848125 also impairs phosphorylation of the retinoblastoma protein at CDK2 and CDK4 specific sites, reduces retinoblastoma protein and cyclin A levels, and increases p21(Cip1), p27(Kip1) and p53 expression. PHA-848125 is added to the cells 48 h after TMZ and cell growth is evaluated after 3 additional days of culture. A drug combination of TMZ, BG and PHA-848125 induces an additive or synergistic effect on cell growth, depending on the cell line. In the absence of BG, the combination is still more active than the single agents in cell lines moderately sensitive to TMZ, but comparable to PHA-848125 alone in the two TMZ-resistant cell lines. When TMZ plus BG are used in combination with PHA-848125 against cultured normal melanocytes, neither synergistic nor additive antiproliferative effects are observed. In the preclinical xenograft A2780 human ovarian carcinoma model, PHA-848125 reveals good efficacy and is well tolerated upon repeated daily treatments. Treatment of K-Ras(G12D)LA2 mice with PHA-848125 (40 mg/kg twice daily for 10 days) results in significant tumor growth inhibition at the end of the treatment and is accompanied by a reduction in the cell membrane turnover. On the other hand, following oral administration, PHA-848125 shows significant antitumor activity in various human xenografts, carcinogen-induced tumors and in disseminated primary leukemia models; the plasma concentrations in rodents being in the same range as those found inhibiting cancer cell proliferation. Inhibition of kinase activity by PHA-848125 is assessed using a strong anion exchanger (Dowex 1X8 resin)–based assay in robotized format run on 384-well plates. In this assay, specific peptides or protein substrates are transphosphorylated by their specific kinase in the presence of ATP traced with [γ-33P]ATP using optimal buffers and cofactors. The potency of PHA-848125 toward CDKs and 38 additional kinases belonging to an in-house Kinase Selectivity Screening panel is evaluated, and the relevant IC50s are determined. For each enzyme, the absolute KM values for ATP and the specific substrate are calculated and each assay is then run at optimized ATP (2KM) and substrate (5KM) concentrations. This setting enables direct comparison of IC50 values of PHA-848125 across the panel for evaluation of its biochemical profile. Method: Melanoma cells are suspended in culture media at a concentration of 2 × 104 cells/mL, dispensed in 50 μL aliquots into flat-bottom 96-well plates and allowed to adhere overnight at 37 °C. Graded amounts of PHA-848125 or TMZ are then added to the wells (4 wells per point) in 50 μL of CM and the plates are incubated at 37 °C in a 5% CO2 humidified atmosphere for 5 days. The cytotoxic effects of TMZ are also evaluated in combination with the MGMT inhibitor BG. To this end, 10 μM BG is added to the plates 2 hours before TMZ and left in culture for the entire period of cell exposure to the drug. ContS1017rol groups are represented by untreated cells and cells treated with BG or DMSO alone. The growth of the cells treated with BG or DMSO alone does not differ from that of untreated cells. MGMT activity of BG-treated cells is undetectable 2 hours after the addition of the inhibitor PHA-848125 and remained essentially undetectable up to the end of the assay. Normal melanocytes are suspended in MGM at the concentration of 1.6 × 105 cells/mL, plated (50 μL/well) and exposed to TMZ + BG or to PHA-848125 as described for melanoma cells. At the end of the incubation period, cell growth is evaluated by the MTT assay. Briefly, 0.1 mg of MTT (in 20 μL of PBS) is added to each well and cells are incubated at 37 °C for 4 hours. Cells are then lysed with a buffer (0.1 mL/well) containing 20% SDS and 50% N,N-dimethylformamide, pH 4.7. After overnight incubation, the absorbance is read at 595 nm using a 3550-UV microplate reader. Cell sensitivity to drug treatment is expressed in terms of IC50 (drug concentration producing 50% inhibition of cell growth, calculated on the regression line in which absorbance values at 595 nm are plotted against the logarithm of drug concentration). Brasca MG, et al. J Med Chem. 2009, 52(16), 5152-5563. Caporali S, et al. Pharmacol Res. 2010, 61(5), 437-448. Degrassi A, et al. Mol Cancer Ther. 2010, 9(3), 673-681. Albanese C, et al. Mol Cancer Ther. 2010, 9(8), 2243-2254. BS-181 HCl : CDK7-selective, IC50=21 nM. SNS-032 (BMS-387032) : CDK2-selective, IC50=48 nM. LY2835219 : CDK4, IC50=2 nM; CDK6, IC50=10 nM. Palbociclib (PD0332991) Isethionate : Phase III for Metastatic Breast Cancer. NU6027 : Potent ATR/CDK inhibitor, inhibits CDK1/2, ATR and DNA-PK with Ki of 2.5 μM/1.3 μM, 0.4 μM and 2.2 μM, enter cells more readily than the 6-aminopurine-based inhibitors. SU 9516 is a 3-substituted indolinone CDK inhibitor with IC50 of 22 nM, 40 nM, and 200 nM for CDK2, CDK1, and CDK4, respectively. RO-3306 is an ATP-competitive, and selective CDK1 inhibitor with Ki of 20 nM, >15-fold selectivity against a diverse panel of human kinases. Purvalanol A is a potent, and cell-permeable CDK inhibitor with IC50 of 4 nM, 70 nM, 35 nM, and 850 nM for cdc2-cyclin B, cdk2-cyclin A, cdk2-cyclin E, and cdk4-cyclin D1, respectively. Palbociclib (PD-0332991) HCl is a highly selective inhibitor of CDK4/6 with IC50 of 11 nM/16 nM in cell-free assays, respectively. It shows no activity against CDK1/2/5, EGFR, FGFR, PDGFR, InsR, etc. Phase 3. Features:Non-cytotoxic, and halts cancer cell growth & could be used in glioblastoma that has relapsed after temozolomide treatment (a chemotherapeutic used to treat many cancers). Palbociclib (PD0332991) Isethionate is a highly selective inhibitor of CDK4/6 with IC50 of 11 nM/16 nM in cell-free assays. It shows no activity against CDK1/2/5, EGFR, FGFR, PDGFR, InsR, etc. Phase 3. 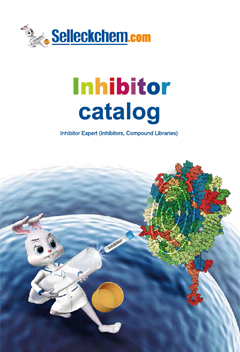 Features:The 1st specific inhibitor for CDK4/6 to show promise in multiple cancers. Dinaciclib (SCH727965) is a novel and potent CDK inhibitor for CDK2, CDK5, CDK1 and CDK9 with IC50 of 1 nM, 1 nM, 3 nM and 4 nM in cell-free assays, respectively. 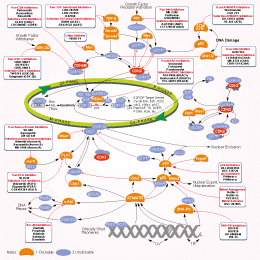 It also blocks thymidine (dThd) DNA incorporation. Phase 3. Flavopiridol HCl competes with ATP to inhibit CDKs including CDK1, CDK2, CDK4 and CDK6 with IC50 of ~ 40 nM in cell-free assays. It is 7.5-fold more selective for CDK1/2/4/6 than CDK7. Flavopiridol is initially found to inhibit EGFR and PKA. Phase 1/2. Roscovitine (Seliciclib, CYC202) is a potent and selective CDK inhibitor for Cdc2, CDK2 and CDK5 with IC50 of 0.65 μM, 0.7 μM and 0.16 μM in cell-free assays. It shows little effect on CDK4/6. Phase 2.
abemaciclib (LY2835219) is a potent and selective inhibitor of CDK4 and CDK6 with IC50 of 2 nM and 10 nM in cell-free assays, respectively. Phase 3. Ribociclib (LEE011) is an orally available, and highly specific CDK4/6 inhibitor. Phase 3.